The Largemouth Bass has the same five senses as most other game fish. Sight, sound, smell, taste and the lateral line. The Largemouth Bass uses each of these different senses to different degrees depending mostly on the water clarity and environment that they live in. Smell and taste are likely the least used senses of the Largemouth. They have a poorly developed sense of smell due to the low number of olfactory folds contained in the nasal passages. The nasal contains 15-20 of these folds compared to 120 or more in some other game fish. Unless the water is very dirty or murky the bass will not rely on this sense nearly as much as others. The sense of taste is a bit more difficult to measure. Although many anglers use scented lures, sprays, gels or concoctions to doctor up their favorite lures, this practice is mainly to cover human scent more then to entice the fish to bite. But, I do believe that by adding scent to a lure it makes the fish hold on to the bait longer then they would with out the scent or taste. The hearing of a Largemouth Bass is a bit better the smell or taste but it is still not their main sense. They do not have “external” ears like a human but rather they have inner ears. These inner ears are made up of tiny bones that can pick up even the most subtle of sounds such as the click of a crayfish. It is for this reason that many anglers add rattles or some other means to add sound to their lures and baits. The lateral line of the Largemouth Bass is much more utilized to find prey and hide from predators. The lateral line is basically a line of pores that extends from the gills to the tail along both sides of the fish. These pores are actually nerve endings that can sense very minor vibrations. By sensing these vibrations the bass can determine not only if prey or food is present but also help them detect if there are predators in the area. It is amazing that a bass can even tell how big something is through theses nerve endings. 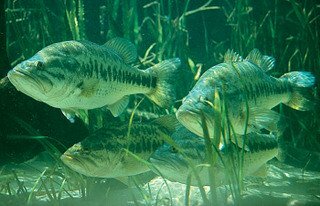 When sensing prey, the bass can detect them at some distance and they can swim in closer until they can use their best sense, sight, to move in for the kill. The sight sense is the most used sense of the Largemouth Bass. In clear water they are able to see upwards of 30 feet. In dirty water it is much less and that is where the other senses kick in. The position of the eyes is key in this sense, a bass can see in every direction except back and down. The bass is also able to see colors very vividly. Many lures contain the color red, this make sense due to the fact that it not only seems like blood but the color red is also the easiest color to see up to about 10 feet deep. In water deeper then 10 feet bright colors are easier to see. If an angler takes all these senses into account, you should be able to see that a loud, smelly, vibration ridden red or bright colored lure may be the best place to start when hunting for the Largemouth. Try a combination of any of these and the results should be stellar.